Dimensions 312' by 29'6" by 10'9"
By the end of the war, the armament on Vendetta included 2 4"/45 dual-purpose guns, 2x1 2pdr, 4x1 20mm Oerlikon AA guns, 2x4 0.50 machine guns, and 50 depth charges. The Vampire or Admiralty "V" class of destroyers were completed in British yards in 1917-1919. They were originally designed as flotilla leaders and were the most powerful destroyers in the world in 1919. However, while still serviceable when war broke out in Europe, they were definitely obsolescent. 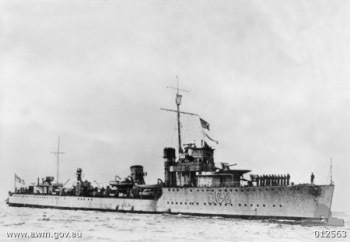 Four units were transferred to Australia in 1933, and in the early days of the European war, when they operated in the Mediterranean, they formed 10 Flotilla. This was known as the "Scrap Iron Flotilla" for obvious reasons. The three survivors returned to Australia by the time war broke out in the Pacific. Other units of this class remained in British service in European or Mediterranean waters. By 1941, the ships were likely not capable of more than about 28 knots speed.